ASHDOD: Hillel Awaskar, an Indian-origin international umpire and former captain of Israel's cricket team, has died after being hit in the neck by a ball during a league match in this coastal city, just two days after tragic death of an Australian player in similar circumstances. "The batsman had struck hard. The fast ball first hit the stumps, got deflected and hit Awaskar on his neck yesterday. He collapsed on the ground," one of the players, Yona, said. 55-year-old Awaskar, who originally hailed from Mumbai, was evacuated to a hospital in a critical condition, where medics were unable to revive him. "The players took him to the hospital but he didn't survive. It's a sad moment for all of us," Yona said. Israeli newspaper Haaretz quoted doctors who tried to resuscitate Awaskar as saying that he suffered a heart attack after being hit by the ball. The Israeli police has ruled out any foul play in the incident but is still investigating the case. Awaskar has been among leading performers for the Israel national cricket team during his youth and continued to be actively involved in the game by later picking up umpiring and even officiating in the European Cricket league games. "I remember Awaskar immigrating as a youngster from Mumbai. He was around 10 or 12 then. He used to be quite a livewire on the field and made his presence on the ground felt immediately," said Shmuel, a friend of the deceased umpire. The Israel Cricket Association CEO, Naor Gudker, who also happens to be an international umpire, said that it was the last game of the league season between Lions Lod and Young Ashdod. "The cricket fraternity in Israel is in a shock. We are all like a family and it is a loss for all of us," he said. "This is a tragedy for his family and for cricket in Israel." 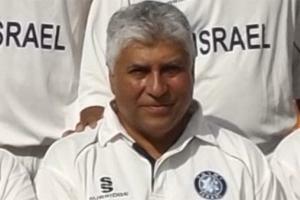 Awaskar, a former captain of the national team, had represented Israel in five ICC trophies since 1982. His last matches for Israel were in division two of the European Championships in 2006. A left-arm spinner and hard-hitting top-order batsman, he had the local league record for the highest score, 244 not out, scored for the Ashdod A side, local media reports said. Awaskar was married with two daughters. Teams participating in the winter league in Israel have decided to postpone the scheduled matches next week with condolence messages pouring in from all over Israel. Cricket is not a very popular sport in Israel, though there is an amateur league comprising players from India and countries like South Africa, Australia and New Zealand. Awaskar's death comes just two days after promising Australian batsman Phillip Hughes died of a severe head injury caused when he was hit by a ball in the neck during a provincial match in Sydney. Awaskar's funeral will be held later on Sunday in Ashdod, family sources said. Hundreds of cricket lovers and members of the Indian community from all over Israel would be attending his last rites.